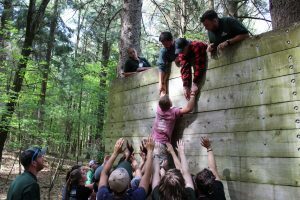 Good communication, patience, and teamwork are all attributes leaders need as well as skills Tamarack Adventure promotes through their programs. Tamarack Adventure doesn’t simply teach these traits to young students, but to people who are already leaders. Eastern Michigan University (EMU) brought their orientation team to learn, reflect, and grow. Referred to as the OTEAM, they run orientation for all incoming students including freshman, transfer students, and international students. Their job is to ensure new students feel at home at EMU and show them the ropes on campus. One program offered to adult and student groups alike is Group Initiatives. With Group Initiatives, guests use problem-solving and good communication to solve challenges, which are tailored to each group. Quanzelle Wyatt, one of the orientation leaders, says his favorite was the wall. With this challenge, everyone on the team needs to climb over a 10-foot wall and support each other. Wyatt loved that, “a lot of people are behind you, being able to support you as you climb.” This builds trust and emphasizes the importance of roles in an effective group since lifters, spotters, and hoisters all have crucial jobs to get everyone over the wall. Without each team member doing their job, success wouldn’t be possible. 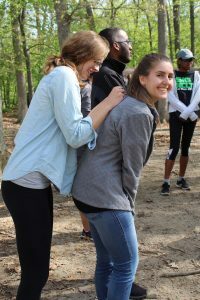 Early on in EMU’s stay, the group participated in icebreakers; short activities meant to get people comfortable with each other. The team favorite seemed to be a version of the name game in which each person had to spell their name with their behind. Though this isn’t a normal icebreaker for adult groups, the orientation team enjoyed the silliness. One person even tried to say their rarely used nickname to shorten their turn, but the other group members wouldn’t let them. Laughter filled the air as everyone had to think hard about how to move their body in the shape of letters. In a team, each member has a role. Without each role, it wouldn’t be possible to finish a job or solve a challenge. Tamarack Adventure promotes good communication to help groups understand the need for honest, patient discussion so everyone can understand and carry out their role effectively. Without trust, it’s impossible to have an open and understanding discussion. Each group builds their trust differently but starting with a comfortable place where everyone can be themselves and have fun, like a silly name game, is a great place to start. 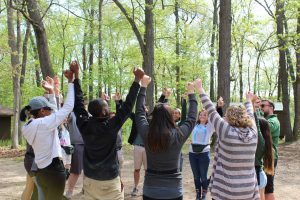 Students and adults alike come to Tamarack Adventure for a plethora of reasons, but they all leave with the same things: a stronger team, budding leadership skills, and great respect for one another.